(Bloomberg) -- Mexican bonds are teetering on the edge of junk as state-owned Pemex, the world’s most-indebted oil company, threatens to drag down the nation’s finances. 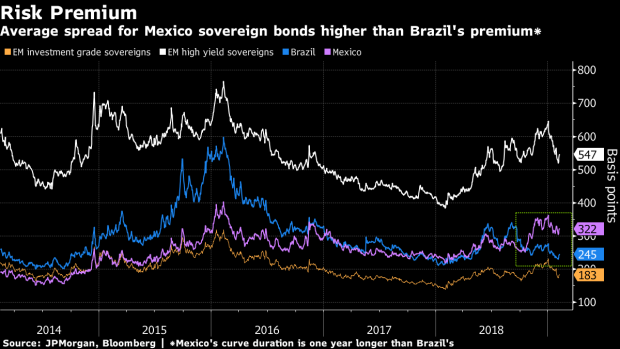 The spreads on the sovereign debt have moved above those paid by emerging-market countries rated two notches below Mexico’s BBB+, according to data compiled by Bloomberg. After Fitch Ratings cut Pemex last month to just one notch above junk, the bonds took a turn for the worse amid speculation that the country would also be downgraded. Almost 70 percent of the respondents in a client survey by Bank of America said they expect Mexico to lose its investment grade in “upcoming years.” As President Andres Manuel Lopez Obrador dithers over a rescue package for Pemex, there’s mounting concern that saving the company will require sacrifice. The oil giant, which represented about a fifth of national revenue in 2018, is weighed down by $107 billion of debt and falling output. The recent deterioration in the nation’s risk profile becomes even more pronounced when compared with Brazil’s. The Mexican average spread is wider than its regional peer -- even though the latter is rated at junk levels due to its rampant debt. After Lopez Obrador canceled a partially built airport and suspended reforms in Pemex that had opened the door to foreign investment, some investors seem to be losing confidence in the new administration. The problem for Mexico isn’t just contamination from Pemex, it’s also the "erosion of the institutional framework that had underpinned investor confidence in the Mexico story over the past three decades," said Roger Horn, a senior emerging-markets strategist at SMBC Nikko Securities America in New York.